BLOX Billet Air Induction Box - Pann Auto Performance - San Diego largest aftermarket automotive performance parts - What do you drive? BLOX Induction Air Boxes are crafted from high-quality aluminum. 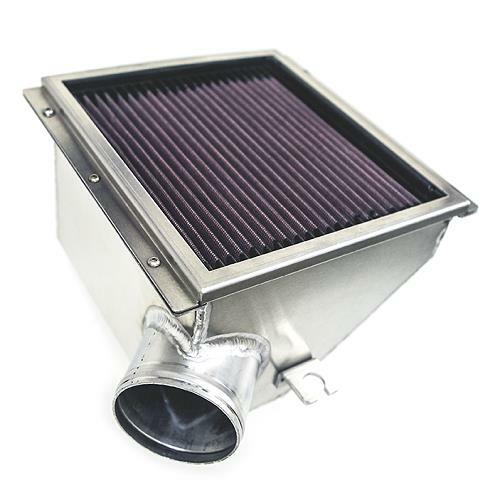 Each air box is handmade and hand-welded to exact specifications to ensure proper sealing and fitment. The air box easily mounts into the OEM mounting points. The BLOX Induction Air Box is designed to increase horsepower and torque across the entire RPM band, providing better throttle response. Initial testing on a stock engine, ECU and without tuning showed gains of +7 HP and +4 FT/LBS. The air box features an internal flared, 3” inlet for which increases air velocity and scavengine. The larger air box provides greater air volume. The cotton air filter panel, also larger in surface area, reduces restriction. The air filter panel is washable and reusable. It is also available as a replacement.